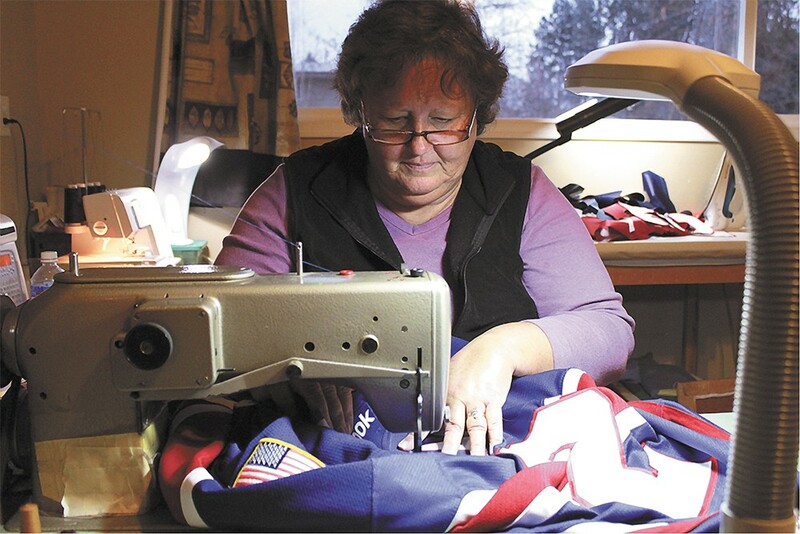 Barbara Parker sews a Spokane Chiefs jersey at her home studio. Barbara Parker sits in a spare bedroom in her North Spokane home, stitching the numbers on a Washington State football jersey while watching the team play on television. "You see your stuff on TV and think 'That's cool,'" she says with a laugh. There are rolls of fabric leaning against the wall, boxes of fabric letters and numbers, an army of colorful threads, and jerseys hanging, waiting to be next under the lamp by the sewing machine. The Cougars. The Zags. The Chiefs. The Eagles. Parker often sees the uniforms she prepares on television. Then there are the fans, the Little League teams, Hoopfest orders and requests from as far away as Massachusetts and Alaska. Parker will sometimes have 600 jerseys to process in two weeks. She sews on letters, numbers, patches, and just about anything you want on the jersey, including the the Sun Bowl patches that we'll see on national television the day after Christmas when the Cougars face Miami in El Paso, Texas. "It's been a blast," she says. "It's not stressful for me." Her mother taught her to sew when she was 10 years old. Parker, who is 6 feet tall, had to start making her own clothes because of her height and the lack of store-bought options. She went to Oregon State University to compete in track and field; she hasn't gotten the call to do the Beavers' jerseys just yet, but her orange lanyard sits proudly on her desk. Once a social worker and a manager at Joanne's Fabrics, she now happily works for herself. Her business took off in 2008, when the Spokane Chiefs went to the Memorial Cup. She says that fans still ask for Tyler Johnson jerseys; he's a former Chiefs star who now plays for the NHL's Tampa Bay Lightning. She is working on six of them right now. "Spokane's fans are pretty dang loyal," Parker says. The work always keeps her on her toes — or fingertips — as teams trade players, need jerseys fixed, or require that special competition patches be sewn on. "You don't know who your next client is going to be," Parker says. "I don't know what work I'll have in two weeks." Sometimes the Chiefs will trade a player, or a visiting team will have a new player arriving that day; she can have a name and number ready and on the jersey in under an hour. While the jerseys themselves are made by big companies, like Nike and CCM, the Chiefs try to do everything else local, Parker says. Someone local paints the helmets, another person puts the logo on the pants. If a team expects to go to the postseason, she is put on alert to be ready to turn around jerseys quickly. Parker remembers how hectic it was preparing for Eastern Washington University's football team to go to the national championship game in 2010. "It takes more than 10 minutes," she says, chuckling. She says that there were easily 150 patches for EWU, and expects the same in getting the Cougars ready for the Sun Bowl. It's not just players who sport the Sun Bowl patches, but also the coaches and anyone else traveling with the team, making for a huge undertaking. On top of her work for WSU, Parker also is getting crushed by Christmas orders from those who have big fans on their shopping list. But Parker herself doesn't own a single jersey. "It's like if you work at Baskin-Robbins, you don't really eat the ice cream," she says.